Here are the rest of my photos from the Shipshewana Quilt Festival from last month. The antique car museum is used to display antique quilts. 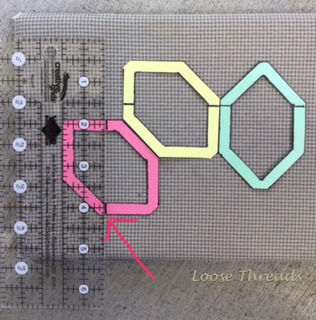 I love this hexagon quilt, and I think it would be fun to make. It was really unusual. These eight pointed stars set in a strippy setting with the big floral triangles made you do a double take. The setting was really simple, but the quilt looked like it had a lot more going on because of the floral fabric. The clam shells look dimensional with a row of white shells in between the prints. There are lots and lots of half square triangles in this quilt. They finished about 1 1/4". This was just an unusual block, and the striped sashing just made the quilt. Blue Gate Restaurant is always a great place for lunch or dinner. I met friends from Shipshewana for dinner there after the Quilt Festival closed. The outside is just as pretty as the inside. In the summer, there are several of these beautiful flower carts around town. The horse and buggy were in the shelter waiting for someone to take a ride. Here's another flower basket across the street from the Blue Gate. This buggy carried Amish coming into town. This is what I bought at the festival. The four wool packs on the left are from the Primitive Gatherings booth. The three pieces of wool on the right are from the Carried Away Designs booth. She has dyed wool to match the Sue Spargo thread that she sells. I got a few spools of that, too. At Yoders I bought more Di Ford fabric. I also bought fabric at Lolly's for quilt backings, but they are in use right now. I'll show those quilts later. Carrie also had the Sue Spargo Creative Stitching book. Since I think I was the only person that loves to do handwork that didn't own this book, I bought it. Happy Independence Day to all of my readers in the US who will be celebrating today. This is the traditional day to have a backyard barbecue, and that is what we are doing this afternoon with family. Here is the center of my table. The pattern for this table topper is in my Etsy shop. I have one of these for every holiday plus others I've made. Several I've given as gifts. This is my Charming Hexagon Pillow done in patriotic fabrics. The pillow uses 1 mini charm pack so if you've collected those like I have, here is a good use for them. I just realized that I don't have a red, white and blue quilt. I'll have to take care of that before next July 4th comes around. I've put some pillows on the porch because we sit out there a lot. It's also a great place for stitching. The pillow on the left below was an idea from my friend, Michele. 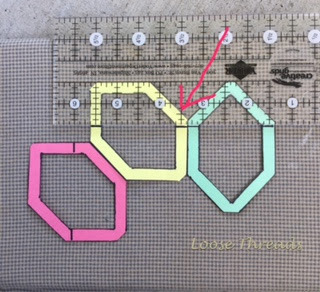 She came to English Paper Piecing group at Back Door Quilts with a pillow done like this in pretty Moda fabrics, and she had done big stitch quilting around each square with embroidery floss (or maybe perle cotton). That was a fun project that also uses a mini charm pack. I made the pillow on the right with 2 1/2" squares and embroidered a flag in the center. 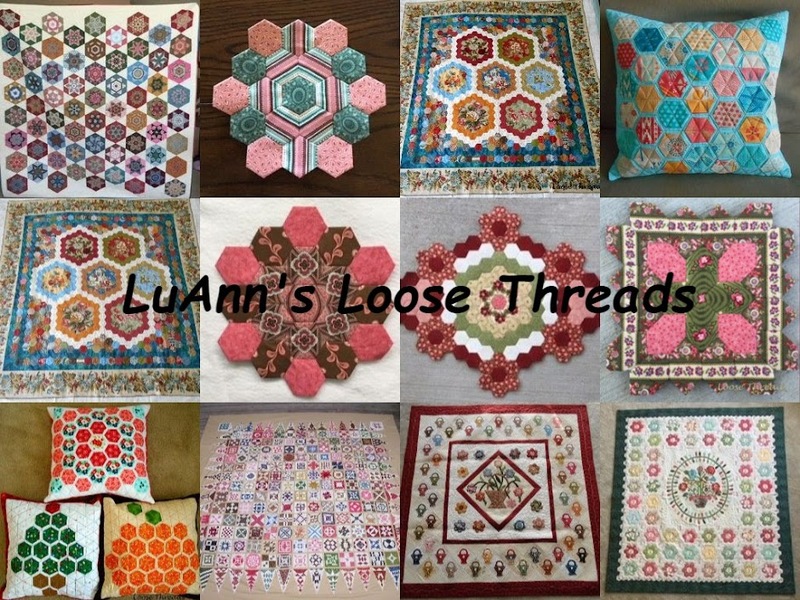 The two little quilts are from the Little Quilts All Through the House book. I still have my copy- published in 1993. I've also displayed my tea towel, a gift from Fiona who comes from England to attend our Shipshewana retreat in the fall. The towel commemorates Queen Elizabeth IIs reign from 1952-2012. It is a treasure even though it has nothing to do with our holiday. Notice I have it back in a corner where it won't be used. If you want to see some cute patriotic decorations go to Janet's blog (roguequilter.blogspot.com). Under her header, she has a link with a tutorial to make a tumbler flag. I have cut some tumblers and still want to do that.